Did you know that three out of five fire deaths were the direct result of homes not having smoke alarms, or having a smoke alarm that didn’t work? You have so many aspects to your home where a fire can strike. From electrical storms that short out your electrical circuits to gas leaks that can spark a fire instantaneously, fires are not something to mess around with. Here’s how you can keep your home safe! If one fire alarm sounds, every fire alarm will sound. This is why it is important to place fire alarms in every sleeping room, on every level of the home, and in areas that fires start easily such as the kitchen. Make sure your alarms are interconnected with each other. 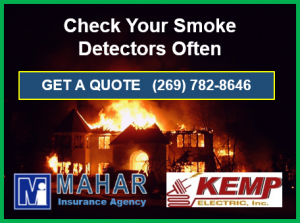 I recently article by Mahar Insurance suggest, checking your smoke detector often help prevent serious fires, and reduces your insurance cost. Not everything is full proof and that includes your smoke alarms. Batteries go out, systems are faulty, and other factors can cause your alarms to not work properly. Test your smoke alarms at least once a month to ensure they are still working. If you have kids, it is especially vital to practice a drill in case of a fire. What should you and your family do when they hear the alarm? How should they get out of the home? Where do you go when you get out? Even if your smoke alarms are working well, it is important that you replace them because just like everything else, the older it gets, the less effective it is. If you don’t know when the last time your alarms were replaced, now is the best time to do it. Did you know that many house fires are started each year from faulty electrical work being done? The danger of working with an unlicensed electrical inspector isn’t one to take lightly. Be sure to get your electrical checked to ensure everything is working properly. Not only is faulty electrical a huge danger, but you run the risk of not getting your property covered by insurance if there is a fire. Remember, smoke rises, and it rises quickly. The best chance you have at getting out of the house before it goes into flames is for your smoke alarm to be triggered as quickly as possible. Hang your smoke alarms high on walls, 10 feet from cooking appliances, and never install them near windows where smoke can escape. 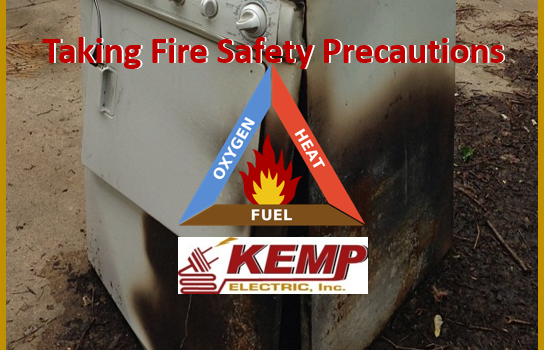 When it comes to keeping yourself safe from fires, taking preventative precautions is key. What other tips do you have for fire safety?